The bloomin’ onion is pretty much one of my favorite appetizers, ever. When my cravings lean more sweet than savory, this bloomin’ baked apple recipe completely hits the spot. My kids love to make this sweet snack with me in the fall. The premise is the same as the onion—an apple is sliced into thin pieces and baked with salted caramel. 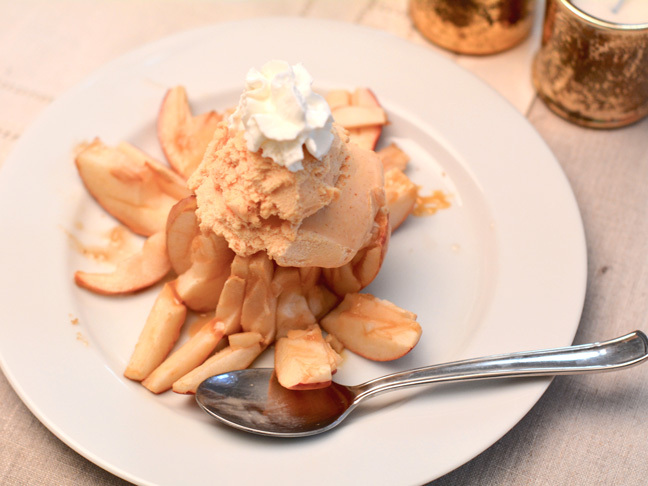 Then it’s topped with ice cream and more caramel to make an insane dessert! This salty-sweet dessert is perfect for serving to friends and family when they come by and way more impressive than just serving a scoop of ice cream by itself. Try it—you’ll love it! Step 1: Heat the oven to 375 degrees F. Line a baking sheet with parchment paper. Step 2: Core each apple and slice off the top third of the apple. Use a small sharp knife to carve the apple into circles and slice into strips, keeping the apple connected to the base. Step 3: Place a square of caramel in the center of each apple and sprinkle it with ½ teaspoon of sea salt. Drizzle the melted butter on top of the apples. Bake the apples for about 30 minutes, or until tender. Remove from the oven and allow to cool for 2 minutes. Step 4: Top with pumpkin ice cream, whipped cream, and caramel sauce. Devour.